As the second wallet in Minimum Squared’s new lineup we’re reviewing this year, today we’re going to look at their Minimalist Wallet. Their award-winning Slim Wallet is a full sized bifold wallet that keeps an impressively thin profile, but the Minimalist takes that a step further. This wallet is cleverly designed to not only hold cards, but give easy access to a few receipts or cash bills. Minimum Squared is the product of a couple, Adrian and Sanela, who were seeking to fill a need of their own. This attempt was so successful that it became a commercial success. It began with their Red Dot Design Award-winning Slim Wallet Elastic, which we had the pleasure of reviewing a few years ago (check it out here for even more about Minimum Squared), and has evolved to a collection of four wallets. Today we’ll visit the Minimalist Wallet. Similar to the Slim Wallet, the Minimalist Wallet is made from a single piece of Horween Chromexcel that has been folded and sewn into the shape you see. Thread is polyester and saddle stitched. Edges aren’t burnished but are cut well and smooth. Construction is excellently done, with no flaws. 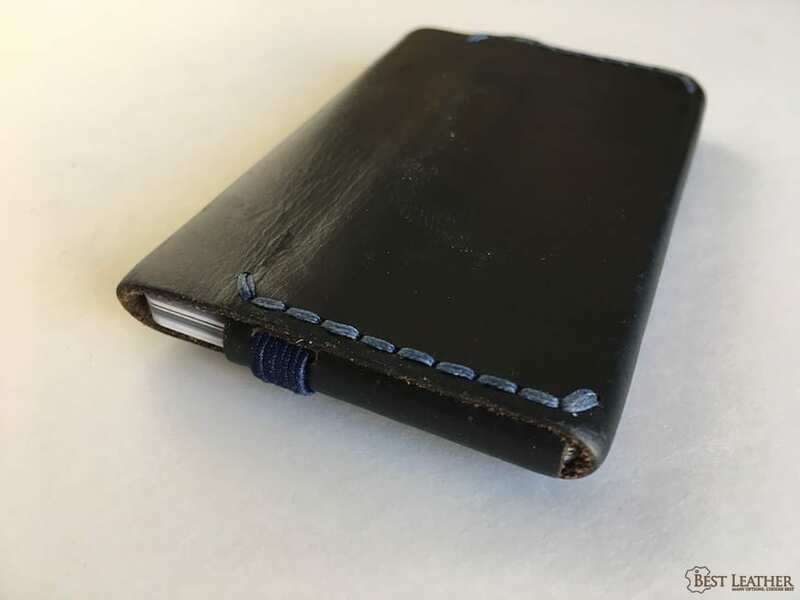 The caliber of the leather and stitch leads me to believe this wallet will last a lifetime. The elastic used to secure the top flap may wear out, but should be relatively easy to replace. At first, I thought the Minimalist Wallet was simply a card holder, but there actually is a secret trick up its sleeve. The top flap acts as a clever slot for cash or receipts. You slide one side of the bills into the slot, then tuck the other side behind your cards. In order to access cards, use the wallet normally, without pushing the top flap back too far. If you want to flip through your bills, you can push the top flap back further, and they pop out from behind your cards for easy access. I wasn’t sure how usable this feature would be, but after trying it a few times I was surprised by how well it works! Overall, this is definitely a minimalist product. The dimensions are barely larger than the cards within, making it easy to forget it’s in your pocket. Minimum Squared suggests 4-7 cards can be held, but I’d reduce that to about five, myself. When I reached 6 cards it became fairly challenging to find and remove the card I wanted if it wasn’t at the front. However, this is leather, and will stretch a bit with use. One tip is to use the part of the elastic inside the wallet as a card divider. You can place a few cards in front of it and a few behind it within the wallet. This makes two cards easy access: the one in front of the wallet, and the one directly behind the elastic. I’ve always had a hard time with the one-pocket card holder type of wallets. The Minimalist Wallet makes some small improvements on the style that make it easier to use. A minimalist wallet has a minimalist look. If you love the look of well-made leather products without flair, you’ll like the look of this wallet. The single-piece design means lots of smooth folded corners and minimal exposed edges. Minimum Squared offers a few colors of Chromexcel and several colors of thread for you to mix-and-match to your taste. I have black Chromexcel with blue thread here. Minimalist Squared’s Minimal Wallet is well constructed of high quality materials and looks great. If you only need to carry a few credit cards and bills, the design is great for keeping them secure and fairly easy to access. The thin profile takes up hardly any room in your pocket. The price is about right for the caliber of product you’re getting. I recommend this slim wallet as a Buy It For Life item. Be looking forward to our review of Minimum Squared’s Cardholder in a couple of months!